Yesterday morning, I cooked breakfast. Not a piece of fruit and a Larabar like I've been throwing in my purse most mornings. Not a yogurt and some raw oats like I usually go for on weekends. I don't usually make "real" breakfast. I'm in a rush to get out the door during the week, and on the weekends, I tend to rise early: Saturday mornings I hit the farmer's market, Sunday mornings I go to the grocery store. I like going early because (a) I'm biking and there's less traffic before 8 a.m. and (b) I'm biking and it's not as hot out yet. So it's a couple glasses of water, a piece of fruit, a yogurt, and I hit the road. But yesterday, I had company. More on the specifics tomorrow, but it was really nice to make a weekend breakfast for people. I made crêpes, which is a delicious, surprisingly quick, and easy recipe. I have a special French-style crêpe griddle that makes them very easy to shape, but I've also made them in a regular frying pan before, and they're just as simple. Combine all ingredients in a blender or mix well with a wire whisk. Put batter in the fridge for at least an hour, then preheat a skillet or griddle to medium heat. Add a small amount of batter at a time, turning the pan gently to make the crêpe as thin as possible. Flip after a minute or so and cook for 30 more seconds. Serve immediately. They can also be done savory by omitting the vanilla and sugar and by using 1/4 tsp. of salt and some herbs instead - I've made them with chicken and spinach for dinner before, totally delicious. 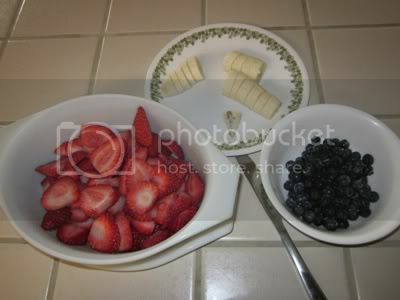 The batter makes about a dozen crepes, at about 123 calories each per the ingredients I entered on MyFitnessPal. There are more calories from the toppings you add - whipped cream and Nutella obviously being more calorie-dense than fat-free Cool Whip - but the thing is, they're sweet enough on their own that they'd be good even plain with some fruit. Light but filling, sweet but not too much, and delightfully French. Perfect! The breakfast was incredible - it was so nice to connect with someone in California who knows my story. It was also really nice to make crêpes again for the first time in a year or so. These are made with butter, for goodness sakes. Real butter. And mine were full of fresh berries and homemade whipped cream. And I savored them in great company, and I had no food guilt. To me, this is the difference between "off plan" eating and a binge. This was enjoyed with friends, and I worked out a little extra in the afternoon to balance it out. A binge is me, standing over the counter or sitting on the living room floor, shoveling in as much as I can, as fast as I can. It's about pain, not pleasure. There is room in my life for crêpes. There is space in my food plan for berries and cream. As long as I enjoy them reasonably and responsibly. Meals like this and days like today help me see that I'm a million miles away from the 345 pound girl I used to be, that I've got this thing won, that even though there will be hard times and struggles, so much of the rest of my life will be full of so many fabulous days just like this. With berries and cream on top. That's great to share your recipe! Another bloggie perk! You are learning the difference between eating for enjoyment and eating for the hell of it. In a binge, sure we want stuff that tastes good... but it loses appeal quickly. 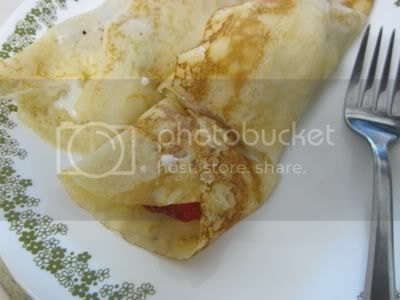 Here you had one or two crepes filled with fresh fruit and real cream- as natural as it can get. It must have tasted like heaven. And after you were done, it didn't seem like you wanted 'more'. You were done. These sound delicious! Like you I never have time to make a proper breakfast before work but this is something I would definitely have at the weekend. I've never tried a savoury one though, might give that a go! These look so yum! I am always iffy on crepes. Could be that I am not much of an egg fan.